Cedar siding is light, easy to nail, and you can often cut it effortlessly. 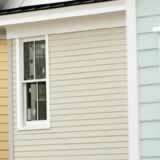 It also usually takes paint, stain, and sealant very well, so it can be a great siding product for your home. You do need to pay attention to a few installation tips though, if you want your project to turn out well. It is important that your cedar siding be acclimatized prior to installation. If your cedar siding is kiln dried, it only needs to be acclimatized if the temperature outside is very hot, or if it was wet prior to arriving at your job site. Several days of being acclimatized in a dry area should be enough. Cedar siding that is not kiln dried may need to be acclimatized for over 30 days, to keep the material from expanding or contracting after installation. An average moisture content of 12 percent is considered acceptable. Store your siding in a covered area, or with a covering over it. It should be stored flat, and up off of the ground. Use a water resistant vapor barrier behind your siding. Following these easy cedar siding installation tips should provide you with a finished project that can last many years. Remember to nail into framing members, and the nail should penetrate a minimum of 1/4 inches. You may want to use a nail punch for the last couple of hammer swings, to avoid marring the surface.